Volunteer shares about sea otters at Jetty Road outreach station in Moss LandingThroughout Sea Otter Awareness Week 2018 (September 23-29) you can meet volunteers from SeaLife Stewards, Sea Otter Savvy, and the Morro Bay State Park Museum of Natural History to learn about sea otters, experience wild sea otters from the best viewing locations in California. Look for volunteers in Sea Otter Awareness Week t-shirts. They will be ready to help you be expert otter spotters with binoculars and spottng scope, answer your sea otter questions, and share how you can help protect sea otters and join the Sea Otter Savvy team! Click on the Sea Otter Awareness Week icons on the map below to find the station nearest you. Each location icon has a photo of the site and hours when volunteers will be present. 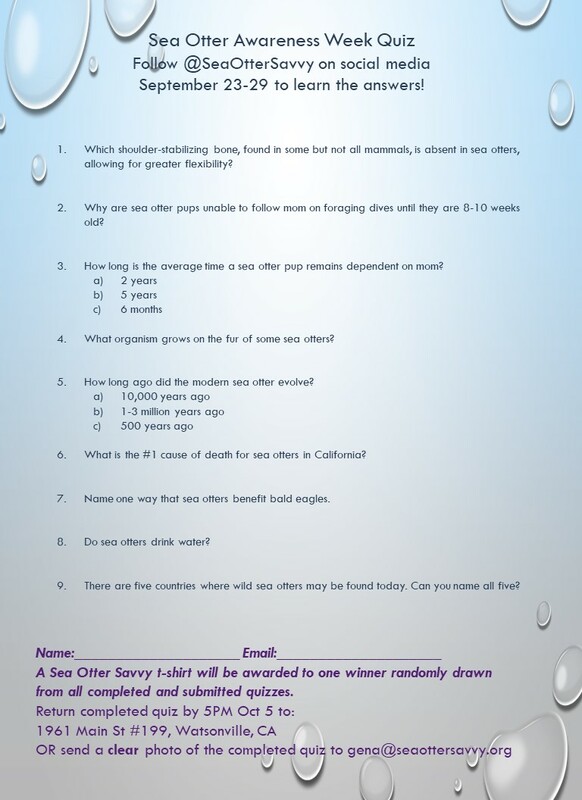 Sea Otter Awareness Week Quiz! How sea otter savvy are you? Follow us on Facebook, Instagram, and Twitter throughout the week of September 23-29 for daily posts to increase your sea otter awareness and ace our SOAW quiz! Winner will receive a Sea Otter Savvy t-shirt of their size and color choice!